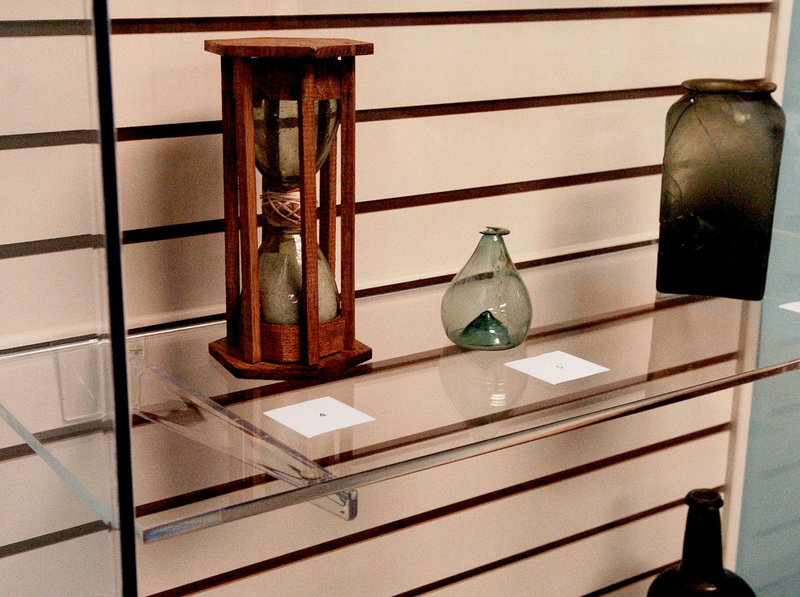 The display case, bought mostly with grant money, will contain artifacts from the most recent dig at Fort Halifax. WINSLOW — In the spring of 1987, the worst flood in Maine history swept the town’s Historical Museum and Fort Halifax blockhouse into the Kennebec River, taking much of the town’s history with the buildings. 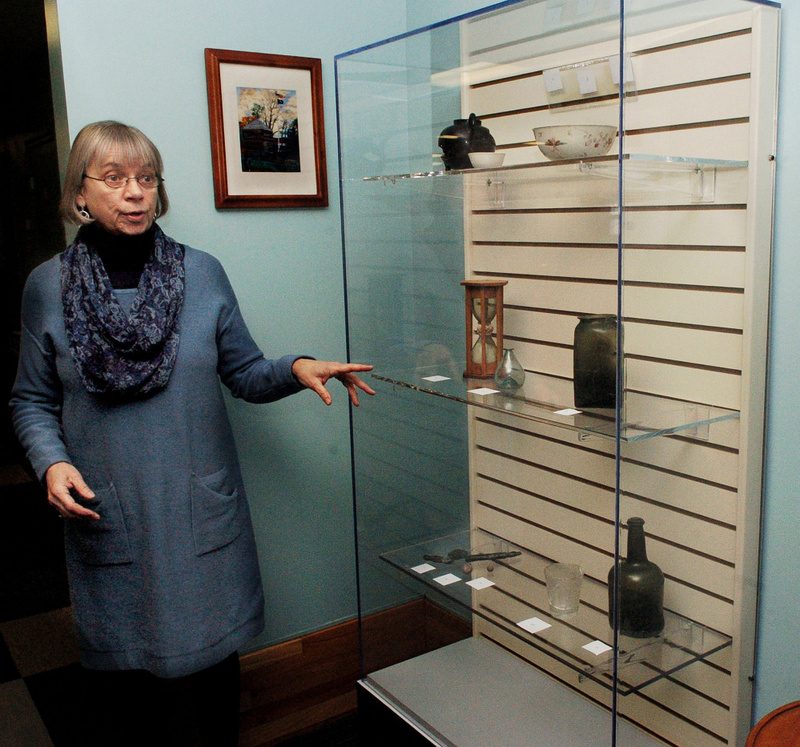 So when a grant came along to provide money to libraries or cultural institutions for a piece of permanent infrastructure at the same time the Winslow Public Library was looking for a way to display historical artifacts, it was perfect timing, library Director Pamela Bonney said. The grant, offered by the Maine Humanities Council, a statewide nonprofit that provides humanities programs and grants to Maine communities, helped the library buy two archival-quality exhibit cases it can use to display the rich history of the Kennebec Valley area. The cases, delivered about six months ago, cost about $5,000 apiece and are made with a special kind of Plexiglas and archival paint that won’t let off fumes that could harm the artifacts inside. Bonney said she has a special spray to clean them with, as well. The grant covered $8,000 of the total cost, which included delivery of the cases, and the town paid about $3,000. One case is fully set up at the Town Office with a speech from William Shirley, who governed the province of Massachusetts Bay in the mid-1700s, and artifacts from both Fort Halifax and Fort Western. The artifacts are in pairs, which is meant to show the connection between the two forts, as Fort Western was the supplier for Fort Halifax. The case at the library, which currently has a temporary exhibit, will feature the Johnston Map of 1754, which explains the different divisions in the area at the time and shows the location of the four Colonial-era forts — Fort Halifax, Fort Western, Fort Richmond and Fort Shirley — on the Kennebec. Bonney said she hopes the reception helps raise awareness of the new “satellite museum exhibits” in Winslow. After the flood swept the blockhouse down the river, the area of Fort Halifax was excavated and a trash pit and privy, or outdoor bathroom, was found, Novak said. Because privies are anaerobic, or oxygen-free, environments because of the nature of the waste, items that fall in the area are often better preserved. The excavation found gin bottles, sandglasses, buttons and cuff links, among other things. The process of restoration took a while, she said, because the area where the fort stood is owned by the state, town and a railroad company. “These are modern boundaries,” she said. Novak would like to expand the Old Fort Western Fund, a 501(c)(3) nonprofit that is membership-based, to encompass all the forts in the Kennebec Valley region. While the blockhouse at Fort Halifax and the garrison at Fort Western are the only two structures still standing, there is still a lot of history to share, she said. “This piece of land represents 300 years of history, and when you add the other three forts, it’s so wealthy in history,” she said. Novak said she would like to have a series of exhibits like the one in Winslow that would rotate around the towns near the forts. Bonney, the library director, said the display at the library probably will be changed once or twice per year, and she hopes to hold more historical events if interest continues. While town officials and the Fort Halifax Days committee have started an improvement project at the fort, Winslow doesn’t have a proper historical society or museum, so Bonney said she hopes the addition to the library will help fill the void and renew interest in the area’s history.